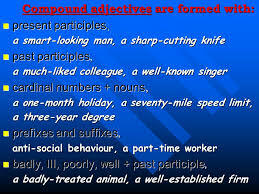 Compound-adjectives, which are widely used in English, are formed of different elements. We're going to study them below. They have their own rules that you'll have to know. BEWARE! 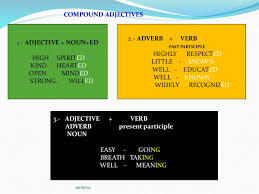 Like every adjective in English, compound-adjectives are NEVER put in the plural, even is this plural is obvious. 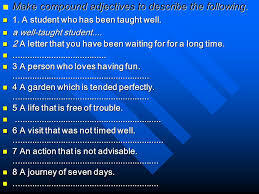 a) Adjective+ verb+ ing : like simple adjectives in -ing, compound adjectives in -ing have AN ACTIVE MEANING (which means that the SUBJECT is doing the action). 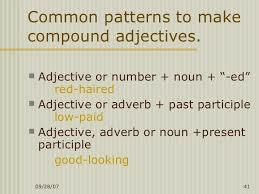 Compound-adjectives follow this pattern: TO BE+ verbal adjective+ -ing= active meaning: The action is taking place, is in progression (progressive aspect). - a hard-working boy = a boy who works hard; HE works hard. 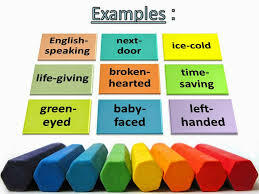 like all simple adjectives in -ed, compound adjectives in -ed, HAVE A PASSIVE MEANING ( which means that the subject ENDURES (or has endured) the action!) let's follow this pattern: : TO BE+ verbal adjective + -ed= passive meaning: the action is endured and has a passive meaning. - a home-made cake = a cake which was made at home. - a blue-eyed girl; a red-haired boy; a long-legged dog; a three-legged table= a table with three legs. - gold-rimmed glasses= glasses with gold rims; a wide-brimmed hat= a hat which has wide brims. 2 hyphens are necessary (between the 3 words). The use of hyphens is more common for compound adjectives than for compound nouns . Please, not that « year » cannot be put in the plural. - This book has 560 pages=> it is a 560-page book (page is in the adjective) ; A three-hour walk= a walk which lasts 3 hours ("hour" is singular in the adjective). - an eighty-cent stamp = "cent" is in the singular. Here are the bases, corresponding to what every Beginner should be able to master... You will brilliantly pass this test, and if you feel like it, you may then try yourself at a more difficult lesson and test test. Good luck! 7. Of course she’s well-behadwell behavingwell-behavedbehaved wellI don't know … Her parents gave her a very strict, but happy up-bringing and she thanked them for it!